For a slow-fashion practitioner, Julia Ramsey leads life at a breakneck pace. Coming off a one-year residency at the Textile Arts Center, the Brooklyn designer is packing her bags for Philadelphia, where she'll take up the mantle as Anthropologie's new head sweater designer. Somehow, between gasps for air, Ramsey managed to squeeze in a showstopping installation of crocheted wedding gowns at the Hilton New York, produce a series of dramatically oversized knits, and stage an "experiment in material estrangement" in her Park Slope neighborhood. Ecouterre paid a visit to the Textile Arts Center's Artists in Residence show to catch a glimpse of Ramsey's "Pelt" collection, as well as pick the designer's brain on how clothing relates to shelter. To say that Ramsey, who once apprenticed with the legendary Kaffe Fassett in London, has a deep appreciation for natural fibers is an understatement. To create “Pelt,” Ramsey gathered large skeins of organic wool roving left in their raw, undyed state. Using knitting needles as thick as broomsticks, she skillfully transformed them into a “flurry of knots and bobbles,” churning out sweaters, wraps, shawls, and a skirt that showcase the fiber’s natural beauty. To create “Pelt,” Ramsey gathered large skeins of organic wool roving left in their raw, undyed state. Each piece, according to Ramsey, serves as a second skin, a “source of comfort, a temporary shelter, a reminder of an animal’s gift.” Because the knits are presented without artifice or embellishment, their material origins are plain to see. Neither do they obey the contours of the human body or give up their independence, she explains. Time-consuming though her process is, Ramsey doesn’t cut corners. 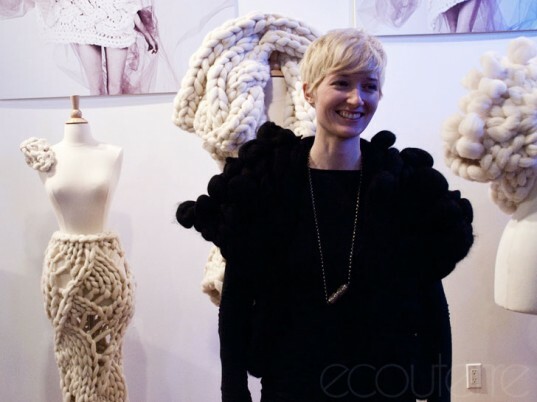 “I’m working to fuse my love for craftsmanship, installation art, ethical sourcing and fashion into one big project,” she tells Ecouterre. Her previous works are equally thought-provoking. For Engaged, an installation that explores a woman’s feelings of ambiguity towards marriage, Ramsey juxtaposed two diametrically opposed gowns. One, knit from golden thread and tulle, hung suspended from the ceiling, while the other, a crocheted number, lay “bound” in a web of ribbon of rope. Ramsey’s appreciation for hand-wrought techniques, along with her desire for beauty without cruelty, is clearly reflected in her work. We, for one, cannot wait to see what she’ll create next. To create "Pelt," Ramsey gathered large skeins of organic wool roving left in their raw, undyed state. 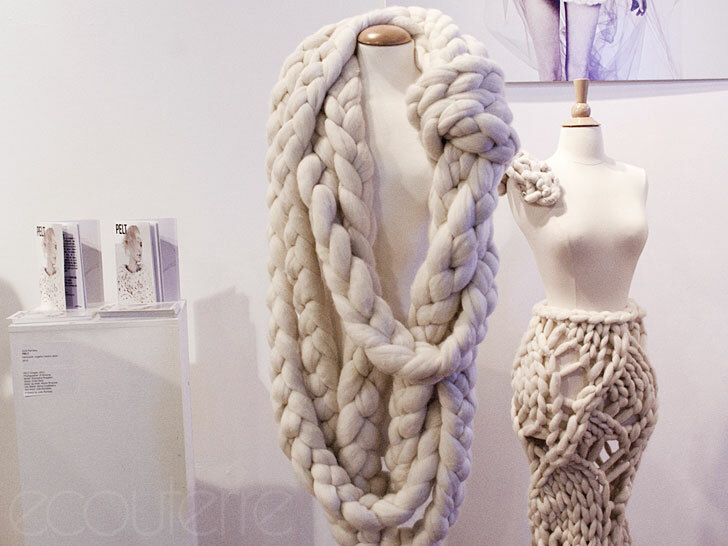 Using knitting needles as thick as broomsticks, she skillfully transformed them into a "flurry of knots and bobbles," churning out sweaters, wraps, shawls, and a skirt that showcase the fiber's natural beauty. Each piece, according to Ramsey, serves as a second skin, a "source of comfort, a temporary shelter, a reminder of an animal’s gift." Because the knits are presented without artifice or embellishment, their material origins are plain to see. Neither do they obey the contours of the human body or give up their independence, she explains. To say that Ramsey, who once apprenticed with the legendary Kaffe Fassett in London, has a deep appreciation for natural fibers is an understatement. Time-consuming though her process is, Ramsey doesn't cut corners. "I'm working to fuse my love for craftsmanship, installation art, ethical sourcing and fashion into one big project," she tells Ecouterre. Her previous works are equally thought-provoking. For Engaged, an installation that explores a woman's feelings of ambiguity towards marriage, Ramsey juxtaposed two diametrically opposed gowns. One, knit from golden thread and tulle, hung suspended from the ceiling, while the other, a crocheted number, lay "bound" in a web of ribbon of rope. Ramsey's appreciation for hand-wrought techniques, along with her desire for beauty without cruelty, is clearly reflected in her work. We, for one, cannot wait to see what she'll create next.